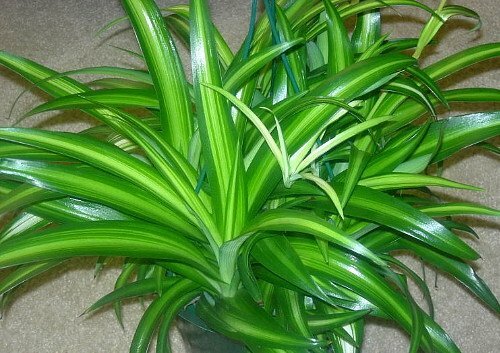 One of the most adaptable houseplants is Spider plant, scientifically classified as Chlorophytum comosum. Spider plant has green with white-striped leaves. It produces long, thin, and slightly arched foliage. It is fairly easy to grow and care for, and it looks very beautiful in a hanging pot. You might be thinking, Why is called "Spider" plant? The name is due to its spider-like appearance. Its leaves dangle from one mother plant or crown and there are stolons that like legs of the plant. Other common names for spider plant include Airplane plant, Spider ivy, Ribbon plant, and St. Bernard's lily. Each has an interesting reason. Spider plant is also known for purifying the air around it. They produce little white flowers in summer. It’s a great addition to any room of a house. Spider plant can adapt to almost any situation. That is why it is one of the best foliage choices to grow indoors. There are more than 200 species of Chlorophytum. Here are some of the most common types of spider plant. 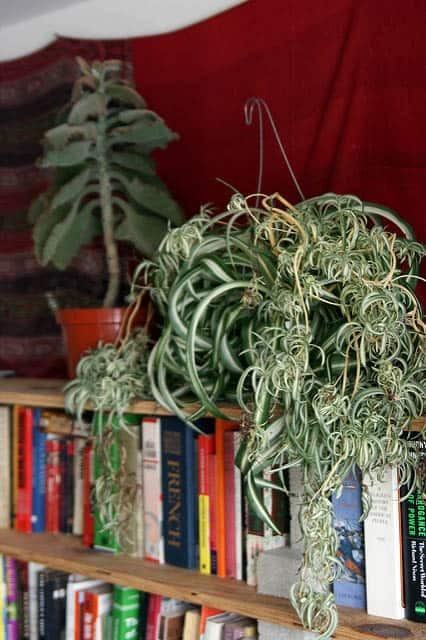 One of the most recognized Spider plants is Vittatum. It has a broad white stripe and slightly curved leaves colored medium green. It’s a great-looking hanging plant. See more photos. Bonnie is similar to Vittatum, but the leaves are more curled than the Vittatum. It’s perfect for small rooms, such as a bathroom or even a small balcony. It grows very quickly. Because most of the time, Bonnie is placed in a bathroom, some call it "toilet plant." They do not need much light. Plus, they purify the air. This is a fast-growing Spider plant with yellow edges that eventually turn white. It looks very good in small hanging pots. It’s perfect for beginners. Also called Reverse Variegated. This is one of the most popular varieties of the Spider plant. It is just an opposite of Vittatum (Chlorophytum Comosum). It has arching leaves with white edges, and dark green stripes in the middle. It is very attractive and also has a wonderful variegation, but you have to give it a lot of bright sunlight or else it might lose its variegation. This is one of most fascinating plants. Hawaiian spider plant is also known as Golden Glow. It’s small in size, and it has green leaves with rich champagne tones. It’s easy to propagate and is a perfect addition to a living room. 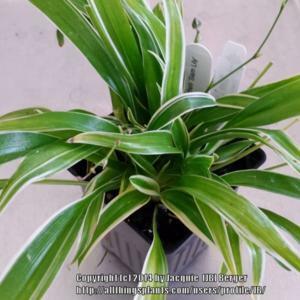 Spider plant is a tough plant that can take a lot of abuse, which is great because if you are new to gardening, Spider plant will not disappoint you very easily. The advised temperature for spider plant ranges between 70 and 90°F. Spider plant can, however, tolerate temperatures as low as 35°F without any damage to it. But it will not grow properly below 60-65°F. Also, temperatures above 90°F will make the Spider plant very vulnerable to toxic micronutrients. Though Spider plant will not be damaged above 90 degrees, it will boost the transpiration rate. Spider plant does not need daily watering, but you cannot completely ignore it either. Spider plants are sensitive to fluoride and salt, which can be found in tap water. So, it is advised to water Spider plants with purified water or distilled water. Using tap water might kill your plant because tap water contains many of other minerals that build up in the plant's roots. Also, make sure that the water you use is at room temperature. Cold or warmer than the room temperature can shock your Spider plant and make them weak. Water when it is necessary. Insert your finger into the soil 2 inches deep, and feel if the soil is dry or not. If it is dry, then it is time to water them. During the first year of the Spider plant, water it every 7 days to keep the soil moist on a consistent basis but not making the soil soggy. Water moderately, and then drain the excess. After the first year, you can water it occasionally whenever you feel the soil is dry. Lighting is an important factor for growing your Spider plant. 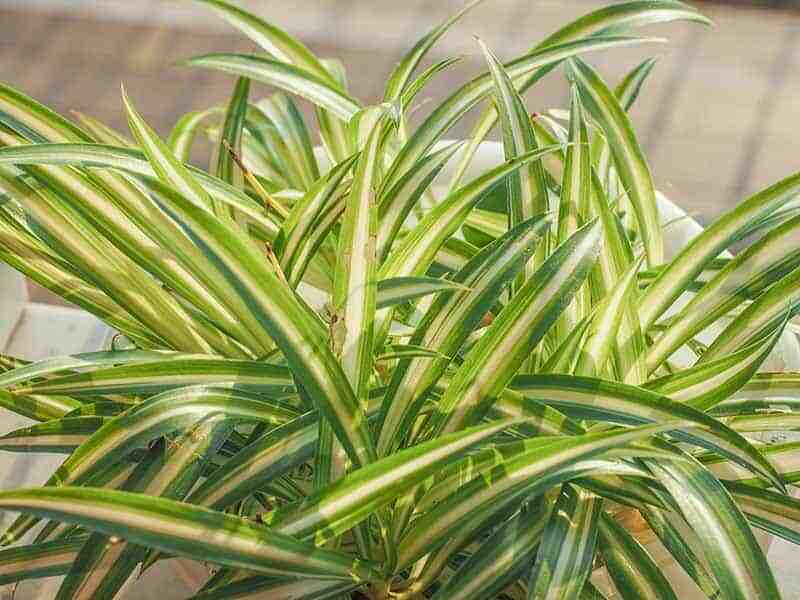 Although Spider plants can grow in a variety of situations, if you want your plant to thrive, you should place it in bright and indirect light. Direct, hot light can kill the plant by drying it out. Spider plants also adapt to semi-shady areas. Twelve hours of indirect, bright sunlight will do wonders for your Spider plant. Spider plant grows very well in aerating, well-draining soil. You can use general-purpose potting soil for Spider plant, but the soil should be slightly alkaline ( pH level of 6.0 and 7.2.). 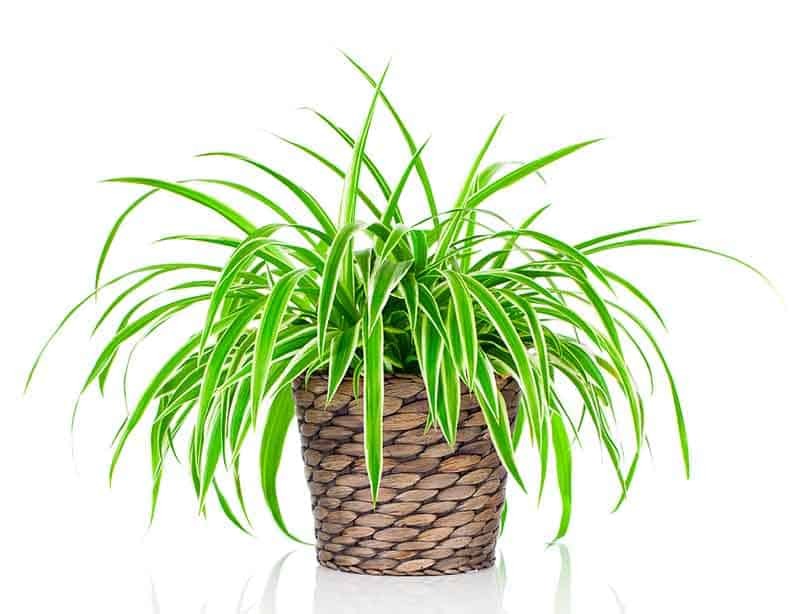 Spider plant is a strong plant and it does not need much fertilization. If you want to boost your plant’s growth, however, fertilize your Spider plant every 2-3 weeks. Be moderate when fertilizing because over fertilization will result in brown leaf tips. It might also kill the plant. There is a wide range of fertilizers available for Spider plants, but most gardeners advise using only half of the amount that is recommended by the manufacturers. And use fertilizers that have no fluoride and very little boron. Average humidity slightly inclining to the warmer environment is good for a Spider plant. During the winter, the humidity is low in most houses. To help your Spider plant thrive as much as they do during the summer, you can mist it frequently. Misting will also keep the plant protected from the attacks of spider mites and other pests. One tip you can implement to give your plant a humidity boost is putting your Spider plant in the bathroom when taking a hot shower. Propagating or growing Spider plants is not difficult to do. In fact, when Spider plants are mature and happy in their situation, they grow plantlets, which are basically baby Spider plants. You can simply remove the baby plants and place them separately in potting soil with some water, and they will grow in no time. But to be on the safe side, follow this step-by-step guide to properly propagate your Spider plant. Spider plants grow off plantlets in an extending flower shoot or runner. There are many ways you can propagate Spider plant. You can propagate it in water and then replant it in the soil. You can directly plant the plantlets into a pot. Both work fine, but some people prefer the water version because they like the traditional way of growing the plant. Make sure the plantlets you are looking to propagate have grown roots of their own. They do not require that much growth, but it needs to have some roots attached to it. You can also replant the plantlet in a separate pot without cutting the stolons or the shoots. After some days, when you see some noticeable growth, cut the shoot. You can find below a useful video about how to propagate spider plants in pot soil. 1. Take a small jar or bottle or cup with water. Prepare or ready the jars of water 24 hours before planting the plantlets. Let the water sit for 24 hours in their jar. 2. After removing the plantlet, place them into the water. Change the water every day. First, remove the plant and then replace the water with fresh water. When removing water from the jar every day, be sure to check the base of the plantlet for any kind of mold growth. If you see any mold, wash it off with water. Do not rub it with your hands to avoid damaging the roots. Simply rinse it under a running faucet. 3. Keep the plants in the water until grow to the mouth of the cup, bottle, or jar. When they have visible roots, plant them in soil following the steps above propagating in soil. If you let it continue, a Spider plant can grow up to 2 to 3 feet wide and high. But occasional pruning will make it more beautiful and it will also rejuvenate their overall health. You should prune it during the summer or spring. Like any other foliage, when pruning you should cut the leaf at the base of the plant. Use sharp shears and remove all dead or discolored leaves as needed. Re-potting Spider plants simply means moving Spider plants to larger pots. It is often necessary to report houseplants as they outgrow their pots, and Spider plants tend to grow faster than most. Spider plants grow best when they are slightly pot bound. However, the plants (roots included), grow fast. You’ll want to think about re-potting Spider plants before the plants crack their pots. Re-potting a Spider plant is fairly easy. You can gently remove the plant from its current pot, rinse and trim its roots, then replant it in a larger pot. When you are moving Spider plants to larger pots, make sure the new pots have good drainage holes. Spider plants don’t tolerate wet soil for very long. Use a general-purpose potting soil or soilless medium for Spider plant re-potting. Fill the bottom of the pot with soil, and then place the plant’s roots in the soil. Keep adding soil and tucking it around the roots until all the roots are covered. Water the plant well and care for it as usual. This is commonly seen in Spider plants. The leaves will have necrotic tips or white areas. These areas might turn reddish or brown due to fluoride toxicity or gray due to boron toxicity. The solution is to use distilled or purified water. This can be due to excessive light or high temperatures. The leaves, especially in the center, will have a bleached out area. The color of those areas is usually yellow, gray, or white. The best way to solve this problem is moving the plant. Try someplace semi-shaded, a little cooler than your average temperature. You might consider it funny or obvious that spider mites are the most common problem for the Spider plant. They generally attack during the summer season. To solve this infestation problem, use an insecticidal soap to spray on to the plant. Do it every 3 to 4 days until you see no sign of Spiders. Another common houseplant pest is the mealybug. They can also attack Spider plants. If you notice mealybugs on your plant, act fast and spray your plant with insecticidal spray or rubbing alcohol. So that mealybug does not spread out to the entire plant. Aphids can kill a Spider plant quite fast if not treated. Aphids feed on the sap of the Spider plant. To treat them, you have to rinse your plant with water and you have to give it a thorough rinse. Then, use rubbing alcohol with cotton swabs to wash the plant and kill the rest of the aphids. 1. I am seeing a root-like growth from the bulb of the plant. I don’t know what it is. It might be a new shoot or runner. Spider plants, when happy in their situation, grow new roots and new shoots very often. In the beginning, it will look a bit white, but it will turn green. 2. My dog tore up almost all of the leaves of the plant. What should I do now? Be patient, new leaves will grow. It might take more twine than usual. Check the leaves, if you see damaged leaves, cut them out with sharp scissors or sheers. Then, carry on with your usual care. Place it somewhere semi-shady. 3. How large should the plantlet be before I propagate them? You can propagate them as soon as you see little root formation. Eventually, the roots will thicken. Make sure to transplant them into deep pots with drainage holes. 4. Today, I noticed my Spider plant leaves feel sticky. Why this is happening? Your plant’s leaves might be sticky because of an aphid infestation. Follow the steps above in the pest section. If you follow the steps in this guide, you’ll know exactly what you should do when it comes to caring for your Spider plant. 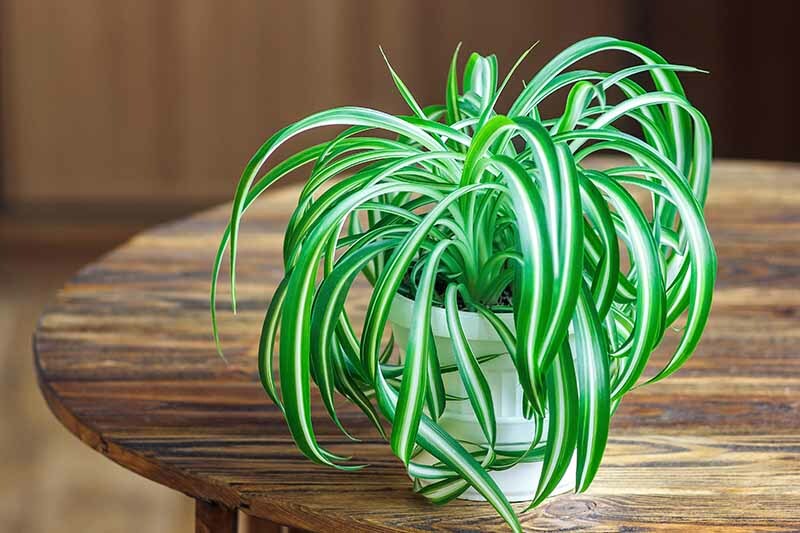 Spider plants are a non-toxic houseplant that isn’t just a showpiece. The Spider plant has air purifying abilities. They intake the toxins from the air that we shouldn’t breathe. 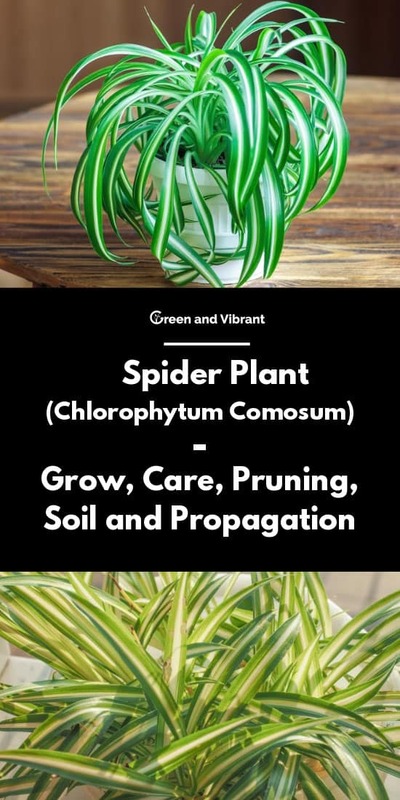 So, add a Spider plant to your garden or somewhere in the house where you spend most of your time, and enjoy.